The Jim Bradac prize was established in 1999 in honour of the late Professor James J. Bradac. The award is made biennially to recognize early career excellence in the field of language and social psychology. The Jim Bradac Early Career Prize is awarded to an IALSP member who, within five years of completing her/his PhD, has already made a significant contribution to the field as evidenced by her/his cumulative body of work to date. The scholar will be awarded the prize based on the distinctiveness of her/his scholarly contributions separate from those of the individual’s mentor and the potential for theoretical innovations in the future. Awardees are invited to participate in an Awards Plenary Session at the following International Conference on Language and Social Psychology. Awardees are also given a small monetary prize to offset the price of attending the conference and the conference fee is waived for the following ICLASP conference. Nominating packages must include the candidate’s CV, evidence of candidate’s early career standing, and a sound argument for significance of her/his contribution to the field of language and social psychology. Nominees should be IALSP members. This biennial award recognises the pioneer work and outstanding contribution of Robert C. Gardner, Professor Emeritus of Psychology at the University of Western Ontario and Fellow of the Canadian Psychological Association. Robert Gardner’s work on the social psychology of second language acquisition and communication is seminal in establishing the field of language and social psychology. 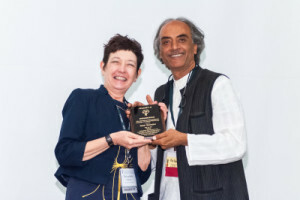 The award is intended for IALSP members who have a record of sustained, outstanding, and currently active research on topics related to second/foreign language acquisition, or on related issues such as ethnic relations, intergroup communication and acculturation, ethnic stereotypes and bilingualism. Competition is open to researchers working in any of these fields. Successful candidates should have obtained their doctorate and achieved a very superior level of accomplishment in their research endeavours for their career level. Awardees are invited to participate in an Awards Plenary Session at the following International Conference on Language and Social Psychology. Awardees are also given a small monetary prize to offset the price of attending the conference and the conference fee is waived for the following ICLASP conference. Nominating letters must include evidence of candidate’s longstanding scholarly contribution in the area of second/foreign language acquisition or on related issues such as ethnic relations, intergroup communication and acculturation, ethnic stereotypes and bilingualism. Nominees should be IALSP members. The International Association of Language and Social Psychology will biennially recognize an Association member who, in addition to having made an outstanding contribution to the field of language and social psychology, has demonstrated a passion, dedication, and deep interest in the continuance and betterment of the Association. IALSP Fellows are honored with a lifetime membership to the Association as a gift of the Association. The Fellows will be nominated by the membership and elected by the executive committee. Nominating letters must include evidence of candidate’s longstanding scholarly contribution in the field of language and social psychology as well as clearly demonstrate the candidate’s commitment to the Association and its scholarly aims. In 2013 the International Association of Language and Social Psychology developed a new award in honor of Tamar Murachver. Dr. Murachver was an active member of our Association, serving enthusiastically for several years on the Executive Board. Dr. Murachver is remembered for her generosity, kindness, and sharp intellect, especially by the many students she supervised and mentored over her years as a scholar. The inaugural Murachver Student Paper Award was given at ICLASP 14 in Honolulu, Hawaii. The Murachver Student Paper Award is now given biennially to recognize excellence in student work in the many areas that constitute Language and Social Psychology. Award winners will demonstrate excellence in writing, socially significant research, and clear distinctiveness of her/his contributions separate from her/his graduate mentor. The award winner will be recognized at the student breakfast and will receive a conference registration fee waiver and small monetary award. To be considered for the Murachver Student Paper Award you must indicate on your ICLASP submission that your paper is “student-led.” Student-led papers are defined as: Papers where the sole or lead author was enrolled as a university student at the time of submission. In the case of faculty co-authorship, the authors are in agreement that the lead student made the most significant contribution to the paper (i.e., research conceptualization, research design, collection and analysis of data, and writing the final report). In all cases the student must be the first author. Itesh Sachdev is recognized as an IALSP Fellow at ICLASP14 in Honolulu, HI. 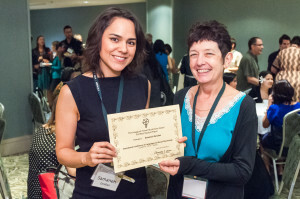 Samaneh Zandian (University of Warwick) receives the inaugural Tamar Murachver Student Paper Award at ICLASP14 in Honolulu, HI.